Sometimes the best kinds of toys are simple and require no batteries. 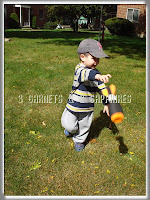 That is why I wanted to feature these three inexpensive indoor/outdoor toys from Monkey Business Sports. The only energy these toys require is kid energy. They are also made of foam, so any accidental impacts would likely not result in any injuries. The Ribbon Plane was a big hit, especially with my kindergartner. 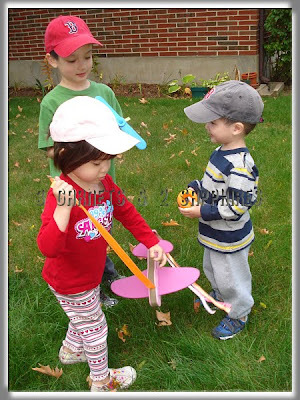 The toddlers did not have the coordination to spin and keep the plane airborne by holding the ribbon, but they did learn to hold the plane by its belly to simulate flying. 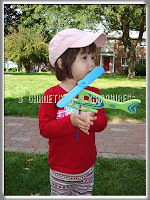 This plane comes in blue or pink, so it would be a great gift for boy/girl twins or different-aged siblings. 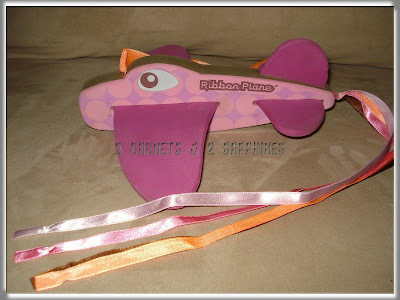 This plane was not only fun, but it survived being banged, dropped, and dragged, so it is well-worth $15 in my opinion. 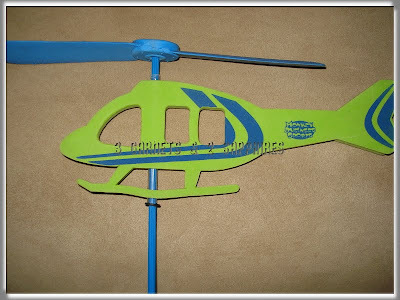 The Handi-Copter was just above our 5-1/2yr old's skill level. However, I think he could master it with a little practice. 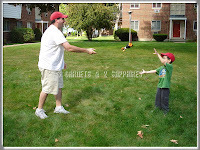 The concept is very simple, just spin the stick in one direction between the palms of the hands. 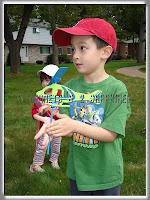 Even though our 2-1/2yr old son could not make this helicopter fly, he did enjoy throwing it to make it go airborne. 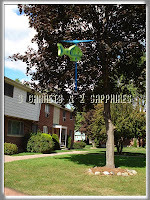 My husband turned out to be the pro as far as flying this copter went. I think this toy would be more easily used indoors, so wind would not be a factor. For the low price of $5, this toy would be a good option for an inexpensive gift or an add-in to an Easter basket. 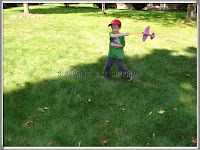 The Chuck'n'Duck is a toy that is fun for all ages and skill levels. 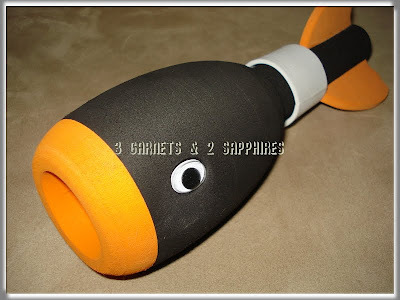 It is a throwing toy that makes a quacking sound when it reaches a certain speed. Although my children were not able to gather enough speed, my husband could and everyone loved hearing the silly quacking. 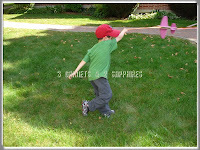 Mainly, this toy is fun to throw and it is much easier to throw than a football for small hands. 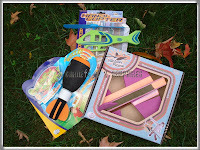 For just $8, this toy would make a great gift for younger and older children. The younger children would just enjoy tossing the Chuck'n'Duck back and forth and the older children would enjoy testing their throwing abilities by trying to make it quack. 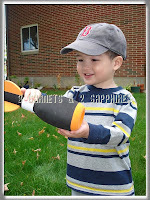 Overall, I have been pleased with the durability of the toys we received from Monkey Business Sports. 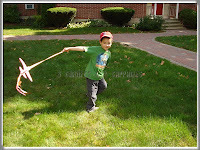 While browsing through the website, I saw many projectile toys that looked like they would be lots of fun, such as a crossbows and rockets. Perhaps in a few years, our oldest will be ready for such toys. To view the full selection of products offered by Monkey Business Sports, stop by MonkeyBusinessSports.com . 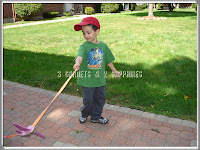 Thank you to Monkey Business Sports for providing us with review products free of charge.